As a young teen in my hometown of Baltimore in the late 1930s and early 40s, I was already an ardent big band groupie and a relentless autograph hound. I managed to attend nearly every appearance of a big-name band that came to town. I collected autographs from Glenn Miller, Count Basie, Gene Krupa, Woody Herman, Frank Sinatra, Duke Ellington, Jimmie Lunceford, Earl “Fatha” Hines, Harry James, Charlie Barnet and Buddy Rich – to name just a few. I’ve now produced a series of original line-art pen portraits based upon many of the musicians who signed my autograph book, plus others of my favorites whom I saw in live performances. I hope Allegro readers will dust off some of their vintage 78-rpm big band records and spin them as they enjoy “listening to my drawings” of these icons of the Big Band era. Eventually, this project will become a published book, with each drawing accompanied by a reminiscence. To start things off, here are my memories of Duke Ellington. 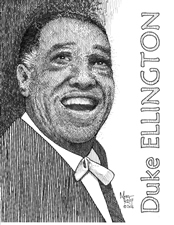 Duke Ellington (1899-1974) as drawn by Mort Kuff. I saw Duke on two occasions. The first was in the early 1940s, when a friend and I attended a Saturday performance of Duke Ellington & His Orchestra at The Royal Theater, Baltimore’s number-one “black” venue. This iconic showplace featured first-run films and always a dynamite stage show. In those days, the front row was reserved for “White People Only.” When we two white teenagers entered the theater, we were ushered down front and seated in the very first row. I remember that my pal and I were well aware that we were being given preferred seating that was not available to the rest of the audience, merely because of our white skin. It was decidedly uncomfortable. Finally, the curtain rose and the orchestra began to play The Duke’s theme. Just a few notes into the theme, a spotlight focused on Duke as he entered the stage, strode from left to right and seated himself at the piano. The audience erupted. He was decked out in an elegant, formal white tuxedo with long tails. He wore a beautiful white tux shirt with French cuffs and large gold cufflinks. At his neck, he sported a flamboyant, flowing white bow tie. He wore a long gold key chain from his right pants pocket. He was wearing spotless white buck shoes. As he was seating himself, he hiked up his trouser legs, revealing the brightest Kelly green socks imaginable. The word that came to my mind was “splendiferous.” He was undoubtedly “The Duke of Ellington.” His program included many of the numbers that we’d all become so familiar with from listening to his 78-rpm records. My feet didn’t touch the ground for weeks. What a lasting memory was created that afternoon. The next time I saw Duke and his orchestra was in the mid-1960s, in the Rainbow Room atop Rockefeller Center. As always, he delivered a swinging performance in his inimitable style, giving credit several times to his co-composer and arranger, Billy Strayhorn. No green socks this time, but he was as equally memorable as when I’d seen him some 20 years before. And again, no opportunity to get an autograph. Finally, here in Florida, I got to know a very special musician, the late Barney Bragin, who led U.S. Army bands during WWII. He told me of his days playing alto sax in Glenn Miller’s orchestra. One day, Barney showed me an original recording contract signed by Duke Ellington. He was kind enough to let me take the contract home with me so that I could make a copy. And so, while I never got to speak one-on-one with Duke Ellington, I finally did get a copy of his signature. ICONS OF AN ERA: Artist Mort Kuff has produced a collection of original line-art pen portraits of some of his musical heroes.